Bumblebee is a 2018 American science fiction action film centered on the Transformers character of the same name. It is the sixth installment of the live-action Transformers film series. It serves as both a prequel and soft-reboot of the series. Directed by Travis Knight and written by Christina Hodson, the film stars Hailee Steinfeld, John Cena, Jorge Lendeborg Jr., John Ortiz, Jason Drucker, and Pamela Adlon, and stars Dylan O'Brien, Angela Bassett, Justin Theroux, and Peter Cullen in voice roles. It was Knight's first live-action film, as well as the first live-action Transformers film not to be directed by Michael Bay, who instead acts as a producer. Principal photography on the film began on July 31, 2017, in Los Angeles and San Francisco, California. 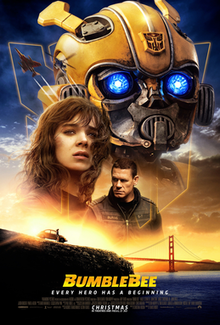 Bumblebee premiered in Berlin on December 3, 2018, was theatrically released in the United States on December 21, 2018, and grossed $468 million worldwide. The film received positive reviews from critics, who praised the action and Steinfeld's performance, as well as the 1980s setting and sense of nostalgia, with many calling it the best installment of the Transformers franchise. Bumblebee grossed $127.2 million in the United States and Canada, and $340.5 million in other territories, for a total worldwide gross of $467.7 million, against an estimated production budget of $135 million. In March 2019, di Bonaventura said they were developing scripts for sequels for both Bumblebee and Transformers: The Last Knight, the latter of which was later denied. ^ a b c "Bumblebee (2018)". Box Office Mojo. Retrieved April 24, 2019. ^ Mendelson, Scott (February 21, 2019). "Box Office: 'Bumblebee' Is First 'Transformers' To Be Saved By China". Forbes. ^ Germain Lussier (December 19, 2018). "How Bumblebee's 1980s Setting Turned It Into Every Transformers Fan's Dream". Gizmodo. ^ "Bumblebee DVD Release Date April 2, 2019". DVDs Release Dates. Retrieved February 19, 2019. ^ "Transformers: Bumblebee Movie Out Now on VHS (Real VHS Promo Copy with Pics!) - Transformers News - TFW2005". Transformer World 2005 - TFW2005.COM. April 1, 2019. Retrieved April 3, 2019. This page was last edited on 24 April 2019, at 21:47 (UTC).